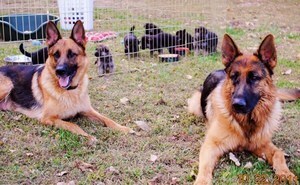 Here at Neel’s Complete K-9 we have a small kennel that specializes in breeding German Shepherd Dogs with a great German bloodline. Our sire has some of the most accomplished show careers in Germany in his pedigree. The two Dams we have also have impressive pedigrees, with working and show titles earned in Hungry and East Germany, so there are many VA rated dogs in our puppies first three generations. We schedule in time everyday for socializing our pups. They are handled and played with everyday by men, women and children. They are exposed to as many types of stimuli as we can think of. Our goal is to provide a HEALTHY, Good looking dog with a GREAT Temperament. We only have 1 or 2 litters a year. We will update this page with current or planned litters. If we have dogs available we will provide links to pictures and more info below. If you have any questions about one of our pups or the training of a dog you can click on the contact us page or please give us a call. We also breed in my opinion one of the best companion dogs there is, the King Charles Cavalier Spaniel. These are one of the best lap dogs I have ever been introduced to, they could not be any happier than when they are relaxing on your lap while you are reading or watching TV. We have taken a lot of care to make sure we are providing a very high quality pet Cavalier. We have the parents and grandparents to some of the puppies that are being whelped now and have not had any genetic heath issues in the 7 years we have been breeding Cavaliers. We have not had any reports from family’s that we have placed our puppies with of any health issues. We make every effort to make sure we provide dogs without any health or temperament problems. These dogs were breed with one purpose in mind and that is to give and receive affection with their pack, be it a 2 legged or 4. If we have puppies available or a litter do in the near future you will find a link below that will take you to pictures and info about the litter.